Steve Hillage was a phenomenal space guitarist (not that he's dead or anything; it's just that now he's more of an electronic guru) best known for being the axeman during Gong's prime, although he shines in lesser known projects such as Khan. In terms of sheer skill and interstellar trippiness, Hillage blows the far more famous space guitarist David Gilmour out of the water. For this particular niche of guitar music, Hillage really is the best there is. This album was recorded while Hillage was still affiliated with Gong. The basic sound of this album seems to be an extension of Gong's You. In fact, he dragged along Gong drummer Pierre Moerlin, saxophonist Didier Malherbe, and bassist Mike Howlett along for the ride. This isn't to say that there aren't some major differences. While You drifts into extended grooves and synthesized ether, there is far more instrumental interplay and soloing here. I'd say that Fish Rising is much more of a tradtitional prog album than anything Gong ever did. For me, this is a tiny strike against Fish Rising as I'm not much of proghead, but it could very well be a positive for you. Also, a key component of earlier Gong is the strange humor of Daevid Allen and Gilli Smith. They are nowhere to be found here, and while Hillage has a quirky charm of his own, it doesn't come out as strongly in an atmosphere so reminiscent of Gong. More annoying is the production. Hillage takes the production reigns himself, and while he would eventually become a fine producer, the sound here gets a little muddy. After hearing Moerlin's drumming with a crisp sound on Gong albums, it's a little disappointing to hear him smeared along the canvas. Keep in mind that this disc is very much a proper remaster, and is far from unlistenable, I just feel that this music would be best heard with a little more definition. Songwise, the album is bookended by some prog epics. "Solar Musick Suite" and "Aftaglid" both clock in around 15 minutes and include some very extended instrumental sections. I prefer "Solar Music Suite" as it flows more and has a much less lumbering main riff than "Aftaglid." In the end though, both tracks tax my attention span a little bit. Sandwiched between is the short "Fish," the synth swirling "Meditation Of The Snake," and "The Salmon Song." "Meditation Of The Snake" recalls the more esoteric synth side of Gong's You, and that makes it winner in my book. "The Salmon Song" is a far more 'concise' prog rocker at eight and a half minutes, but it has the benefit of including a killer guitar riff. I feel like Fish Rising was conceived more as a 'side project' to the mothership band of Gong. Hillage would sound much more committed on his second solo album after leaving Gong. Hillage did better soaring than grounded with a heavy prog sound. Just as a side note, I always get an image of midgets dancing around a tiny model of Stonehenge 5:44 into bonus track "Pentagrammaspin." Very interesting synopsis, and I agree with you about the sound--at least on the vinyl. The CD sounds much better in my opinion. One of my fave Canterbury albums! Muchas gracias por el posteo de este album y por el link actualizado. Unfortunately the file of the working link it can´t be opened. 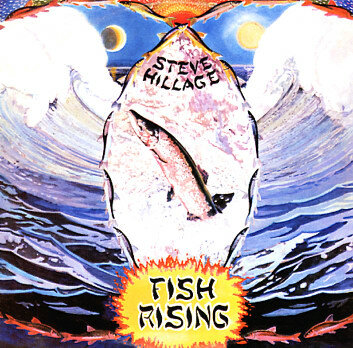 You can also find the album in this post: http://avaxhome.ws/music/rock/progressive_rock/Steve_Hillage_Fish_Rising.html . lossless links are dead, but one mp3 (@320) link still works. in case anyone is interested in a lossless rip, drop a message here, and let me see if I can help :) I have both the 1996 edition (Virgin CDV 2031 - flac) and 2007 remaster (including 20 min. of bonus tracks - Virgin CDVR2031 / 00946-373415-2-0 - ape) in lossless formats. My dream birthdate/birthplace is definitely 1946 in Canterbury... i was born more than 40y too late and on the other side of the English channel... bummer! Dr. Schluss stares at yoo. Howdy folks. This is my attempt to spotlight some lesser known tidbits of psychedelia. The aim is to sonically reprogram your mind. I'm always searching for something new and bizarre, so check back every once and a while. And if you have any suggestions or mp3s of something really interesting, please drop me a line.